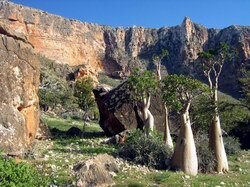 Socotra is a perfect place for those who like trekking. All our programs offer trekking routes that allow you to get to know better the island’s nature and inhabitants. We adjust our programs to the time of your coming. If you come after a monsoon season we would recommend you to walk through wadis full of natural water pools. In the hottest time of the year it is good to trek in Haghier Mountains. There are various trekking routes you can choose depending on your walking experience. The routes may take from one hour to two weeks. 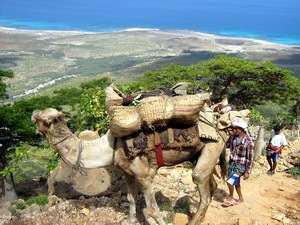 For those who want to see the inland Socotra we offer trekking routes backed up by camels. You can agree itineraries lying through Socotra’s “tourist” places and trekking rates beforehand. The most popular routes - Hadiboh-Dixam (3-4 days), Rush-Matiaf (2-3 days), Hadiboh-Noget (7-10 days). Over much of routes trekking rates are usually low. Camels are usually used to carry your personal things, water and provisions. So you can fully enjoy picturesque sceneries and breathtaking views. You will stay overnight in tents and enjoy meals cooked for you by our guides. Trekking activities will allow you to watch the island’s nature more closely and to make great photos. Besides, you will be able to see the places not accessible by cars. In addition to well-known hiking trails, we organize trips to the less-visited places of Socotra, which we explored in recent years. These services are available for individuals or small groups. Contact us and we will offer for you a unique program, you will not find in other agencies.